Vegetarians are accustomed to limited options at fine restaurants. Yet San Francisco’s Greens has given generations of vegetarians (and their carnivorous friends!) 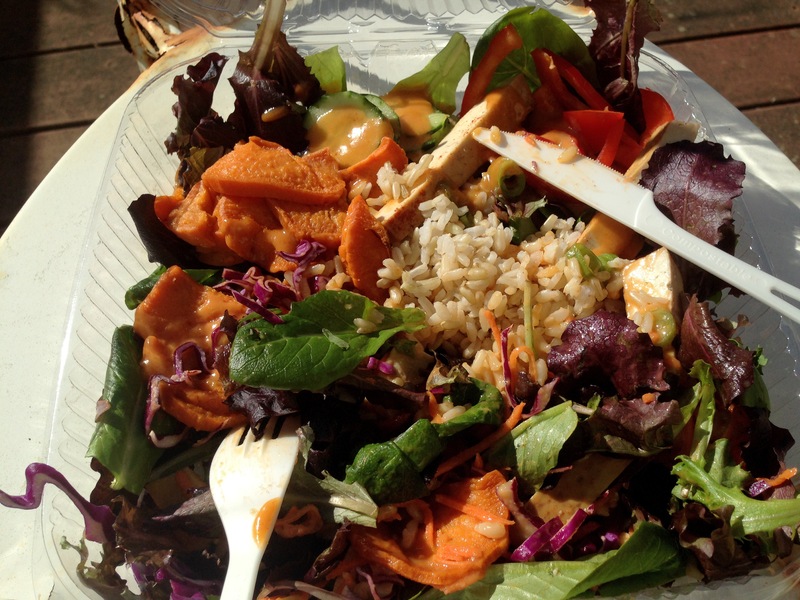 living or visiting the Bay Area meatless, international farm to table experiences since 1979. If you are a vegetarian in the Americas or Europe, your restaurant dining options typically force you to choose between casual restaurants that cater to vegetarians and vegans, mainstream restaurants with a few veg-friendly options, or the fine restaurants with one vegetarian main course (if that). If you want a truly memorable meal and want to get a bit dressed up, you might find yourself reading through sample menu after sample menu on restaurant websites in search of something you can eat. San Francisco’s notoriety for its progressive culture – as one of the first food-obsessed US cities, the Mecca for “granola” hippies (now, a new generation of hipsters), and a general health consciousness – led me to conclude I would find a host of great vegetarian and healthy restaurants when I relocated to thw city. Now, I am not a vegetarian, but I enjoy eating and cooking vegetarian food, and I am empathetic to my vegetarian friends. It came as a surprise that finding a great vegetarian menu in the Bay Area was more difficult than I expected. When I finally discovered Nourish, a tiny, casual vegan café, I was ecstatic. I had so many options to choose from, and the salad (photo above) I finally chose did not disappoint me. Nevertheless, Nourish is a stereotypical veg/vegan restaurant: It is tiny, cramped, and minimalist. It frequently has a long line out the door for its patrons, predominantly ordering takeout (as you wouldn’t have room or time to really sit and mingle). It’s also not open for dinner, and its Inner Richmond neighborhood location is not exactly accessible for many San Franciscans, not to mention tourists. When a vegetarian friend introduced me to Greens, it defied most preconceptions I have for vegetarian restaurants. First, it occupies prime bayside real estate at the Fort Mason complex (former Army post), wedged between the North Beach and Marina neighborhoods and which hosts an exceedingly popular farmer’s market and one of food truck festival Off The Grid’s weekly events. Now Greens’ decor admittedly has an earth-friendly late 1970s vibe, but in a sleek and airy, blond wood and high ceiling sort of way. 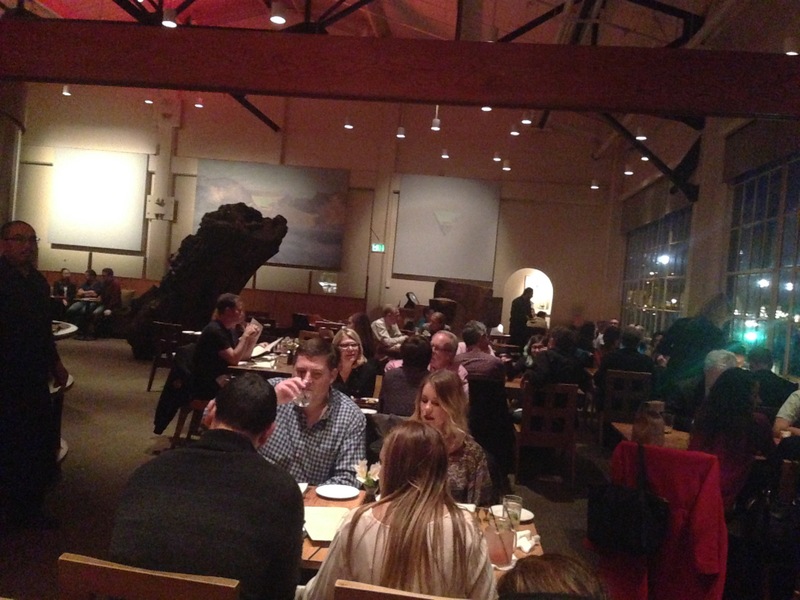 An artful petrified redwood tree greets visitors upon entry, the restaurant’s only real indication of its roots in the “crunchy” 1970s California health food movement. Its large dining room is otherwise tasteful and timeless, with perhaps the city’s best restaurant view of the Golden Gate Bridge and the marina. Greens’ menu is a study in internationally inspired fare, carefully prepared from local California produce, grains, and cheeses. As expected of a fine restaurant, the menu changes seasonally, but it retains a few staples, such as a spring roll appetizer, hummous, and grilled brochettes. Notes of India, east Asia, North Africa, the eastern Mediterranean, and the USA weave through the menu, offering the diner almost too many options. 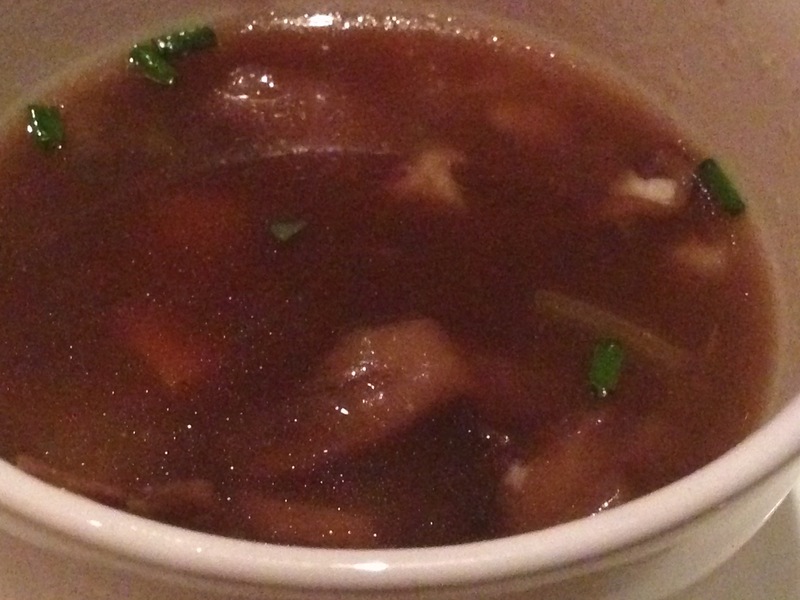 The server was kind enough to let my friend and I split the special mushroom and barley soup as an appetizer. From the description, I expected a bisque but found what my friend described as a “lighter, vegetarian French onion soup” – well, with barley. It could have used more melted cheese than its delicate topping of grana padano, as well as crostini to make it even better, but I had no complaints. 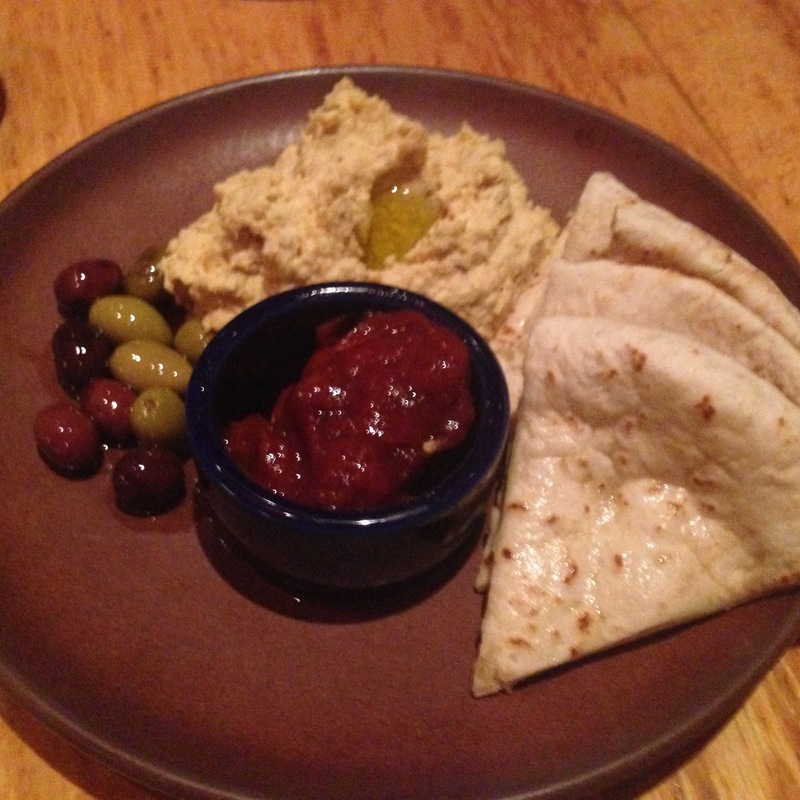 We split the hummous platter, and as my friend is an understandably particular Arab, her endorsement spoke volumes of Greens’ quality. High quality olive oil and the right amount of tahini makes all the difference. A meal so good, i forgot to take a photo until it was half gone! Having eaten a heavy lunch, I had to pass up wonderful main courses such as a butternut squash and sweet potato gratin or spinach and chard filo pie. I chose a single vegetable brochette as my main course. My friend explained that one of this dish’s draws was its locally produced (Hodo) tofu. The skewer, which included unexpected chunks of refreshing fennel bulb, peppers, onions, and mushrooms, was grilled nicely without an overpowering marinade. 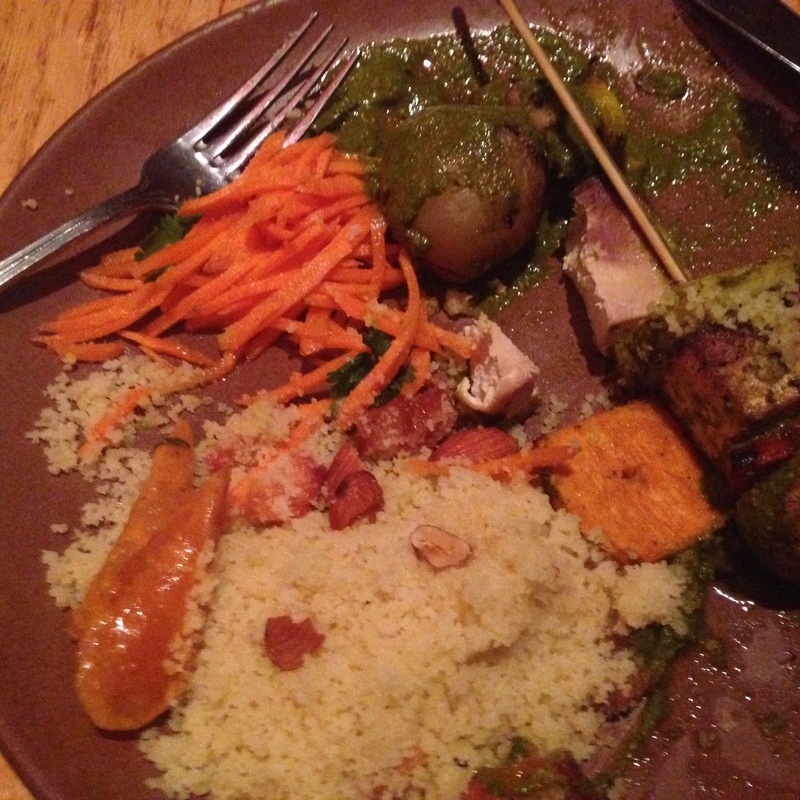 It was served with couscous and a green herb puree reminiscent of a light, more subtle chimichurri. My friend chose a heaping portion of red curry with spring vegetables (pictured in the featured photo), which was delicious. The dessert menu was extremely tempting. Alas, Greens’ healthy portions left us without room. A banana-chocolate cake particularly caught my eye. Next time! So vegetarians, vegans: if you haven’t tried Greens, you are missing a true treat. Omnivores: Greens is for you. A wide variety of hearty but restrained options will leave your stomach full and tastebuds more than satisfied. Carnivores: Don’t turn your nose quite so quickly; you will find yourself pleasantly surprised to find your favorite international comfort foods never needed the meat in the first place!